The Gospel as well as our CHM mission mandate that we care for the least among us. As women of faith we feel called to speak publicly and act fearlessly in support of refugees forced to migrate from their home countries and/or immigrants seeking safety and a new life in these United States. To make that point, in 2017, the sisters issued the following statement on support for refugees and immigrants. On June 22, 2018 during the CHM General Assembly, a CHM Action Statement on Comprehensive Immigration Reform was affirmed by CHM Members and Associates. Sr. Mary Ann Vogel, CHM President, said, "The CHM mission is to work for justice within the human family. It was only right that at this moment in our nation's history, at this CHM Assembly, we should adopt the 'CHM Action Statement on Comprehensive Immigration Reform' which calls for a halt to immoral policies and practices. What does love your neighbor as yourself mean? Certainly not separating parents and their children." Download the entire statement HERE. Sister Molly Munoz and Sister Irene Munoz work with the migrant and immigrant farming populations in Colorado and Iowa. CHMs financially support the Diversity Service Center of Iowa (DSCI) in Muscatine, Iowa, whose purpose, through educational outreach, is servicing people from all over the world who live in Muscatine and surrounding areas. 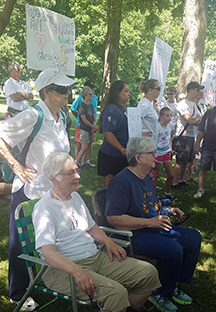 Participation in rallies such as the recent “No Hate Rally” in August 2017 and in June 2018 a protest about how our country handles asylum seekers and the separation of children from their parents. Sisters write or call their legislators expressing their concerns about current situations as they arise. CHMs are a part of the Catholic Sisters of the Upper Mississippi River Valley, a collaborative group of 12 congregations who respond to social injustice with media campaigns one example being the immigration billboards campaign using the image above and the "Pray it Forward" campaign below.